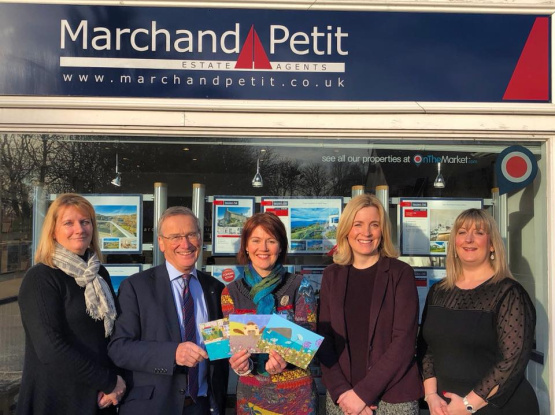 Marchand Petit are well known for their support of local community activities, especially concentrated around their six well-placed South Hams offices and always delight in working with local companies and individuals. A recent collaboration brought a ray of sunshine and colour to the Newton Ferrers office, to be enjoyed by recipients in their area. Jackie Gale, the award-winning textile artist, supplied three examples of her fabulous artwork to adorn their Valuation Week Invitations. Marchand Petit sell properties across all sectors of the market, from waterside studios, cottages to estates and equestrian and countryside residences. Jackie Gale will be exhibiting at the Country Living, London Spring Fair at Alexandra Palace, 26-29 April 2018.